Easter is coming up, and with it, the wonderful CANDY that is only available for a short time each year. When I was a kid, no matter how careful I thought I was being, I would always eat myself to a stomach ache, I loved that candy so much. Therefore, I know it well. As I think a lot of people do. So what do the designers of the movie poster for the new animated/live-action film, “Hop,” take us for? Several of these items are not typical Easter candy, such as horrible, horrible licorice All-Sorts, Gummy Bears, and peppermints, and some, namely the candy canes (huh?!?) actually go with another rather well-known holiday. I will excuse the M&M’s, which are basically the correct pastel color, but aren’t really an Easter fixture. But where are the Peeps, the fake chocolate foil-wrapped eggs that make you gag, the Cadbury Cream Eggs, or the chocolate bunnies? Could they not get a licensing agreement with them or something? You’d think that a movie like this would be a product-placement gold mine, right? And not to nit-pick, but Easter jelly beans should be clearish, not opaque like M&M’s, and there have to be at least a few black ones. 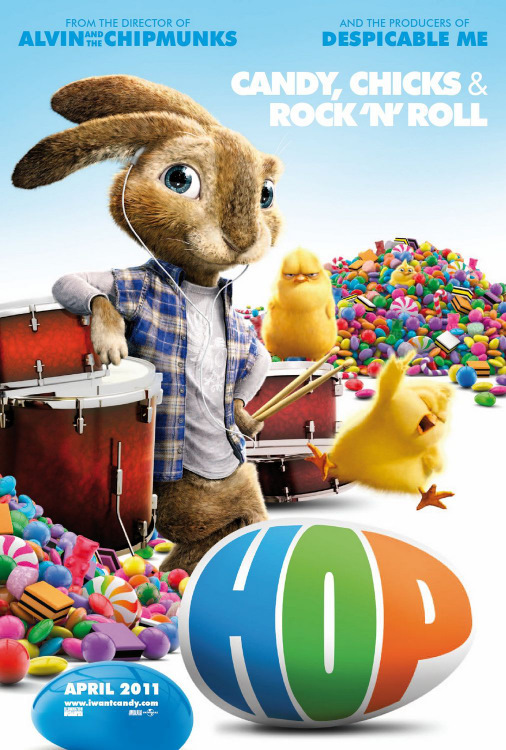 Have the people who designed this poster ever actually celebrated, or at least stolen the candy from someone who celebrated, Easter? Yeesh. I’m sure the movie will be as brilliant as the poster, too.